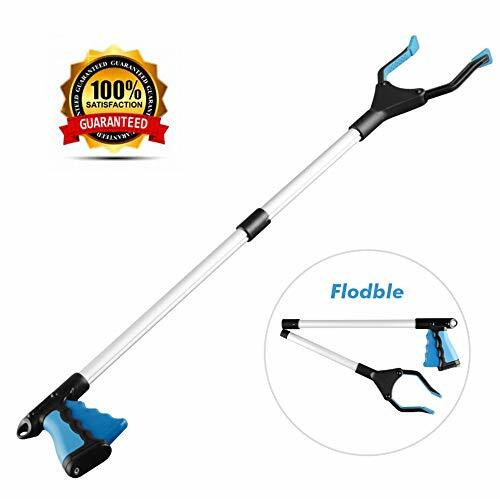 ❤With this 32'' Foldable reacher grabber you can pickup anything easily from the ground, the bottom of the bed, and behind the sofa. This grabber reacher tool is made from lightweight aluminum with ergonomic handle trigger design, lightweight for easy to use, great for anyone who facing mobility problems or who don't want to bend over or climb a ladder. And the grabber tool has Lifetime Warranty, 100% Satisfaction Guarantee. ❤This reacher grabber can help most people. Especially for users with mobility limitations(such as bad back, disabled, elderly, bedridden), injuries, and pregnancy. Use this grabber to reduce the risk of injury to your back, spine or arms due to the sudden pulling action/jerking motion when you bend over. We believe our grabber tool, If you have any questions about this grabber tool, please contact us freely, we will reply within 24hour. ♥Use this grabber to pick up trash and litter in the yard or on the street. ♥Use this grabber reacher tool to pick up broken glass pieces on the ground. ♥This reacher grabber can reach under the furniture and the beds. ♥Use this grabber tool for elderly to retrieve items in hard to reach cabinets. ♥Use this grabber tool for elderly to pick up daily things such as the newspaper. ♥Use this grabber tool for elderly to pick up clothes from your washer or dryer. ♥This grabber is ideal for home, workshop, yard, boat, or garage use. ♥Plus many many more uses, this grabber reacher tool will make your work become easier. ❤NOTE: Vertical load capacity: 22lbs; Horizontal load capacity: 3lbs. If you have any questions about this product by NYard, contact us by completing and submitting the form below. If you are looking for a specif part number, please include it with your message.